Making an ecommerce business thrive has become a daunting task as competition in the digital marketplace is heating up. This bottleneck has made it important to enhance your relationship with the customers and prospects. Despite this, ecommerce marketers often practice email marketing without any specific strategy, which means that there are no clear goals to achieve. There would be no accountability and you would not be able to know what’s working and what’s not. Another common mistake committed by ecommerce email marketers is sending only promotional and sales emails to the recipients. As an implication, it would be difficult to build a relationship with the recipient. Therefore, if you want to grow your ecommerce business with email marketing, in-person customer interaction through a thoughtful email marketing strategy is a must. Whenever you have a new subscriber, make sure you welcome him or her with an interesting email that introduces your brand and shares an overview about the products and services. You can offer discount coupon codes to the new subscribers and entice them to make the first purchase. We recommend you send a series of welcome emails to drive better subscriber engagement. 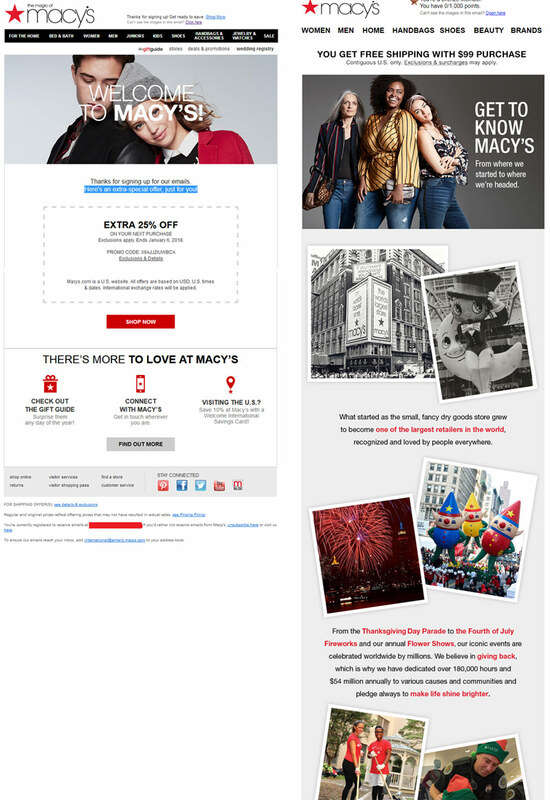 Take a look at the welcome email series sent by Macy’s. The first email welcomes the subscribers with “Extra 25% off” and the second email shares a compelling story about how it grew to be one of the largest retailers in the world. Personalization is the key to effective email marketing for every sector including ecommerce. Draft tailormade emails based on the age, demographics, past purchases, total purchase value, etc. Besides first name personalization, utilize the principles of artificial intelligence to create hyperpersonalized emails that are more relevant and deliver value to the reader. A/B test multiple variations of your email campaigns to understand what’s resonating the best with your subscribers. 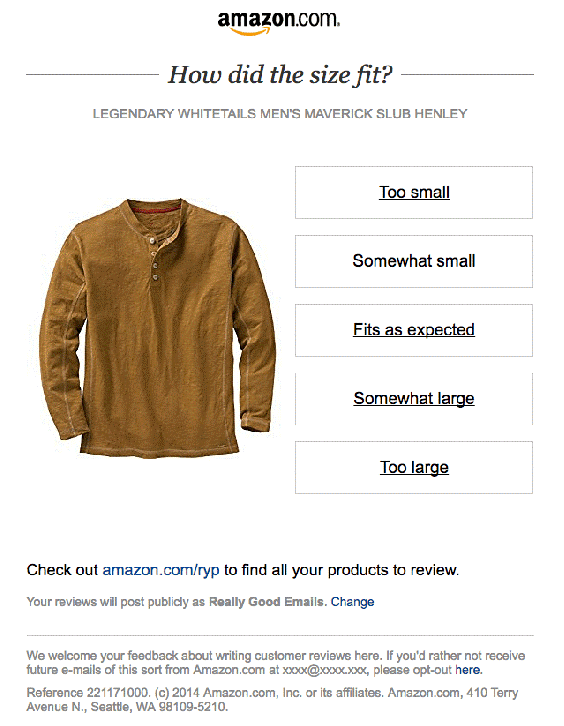 Amazon sets a perfect example and creates relevant emails based on the past activity of the subscriber, by practicing artificial intelligence. Many of your customers almost purchase from your ecommerce store only to leave the item/s in the cart. You can bring back such customers and get them to complete the purchase with the help of a cart abandonment email. As discussed in welcome emails, send out a series of cart abandonment emails to ensure more conversions. ASICS sent me a series of two cart abandonment emails when I left a product unattended in their cart. The header of the first email – “Did you leave something behind” along with the product image worked as a reminder that I intended to make a purchase but did not complete it. 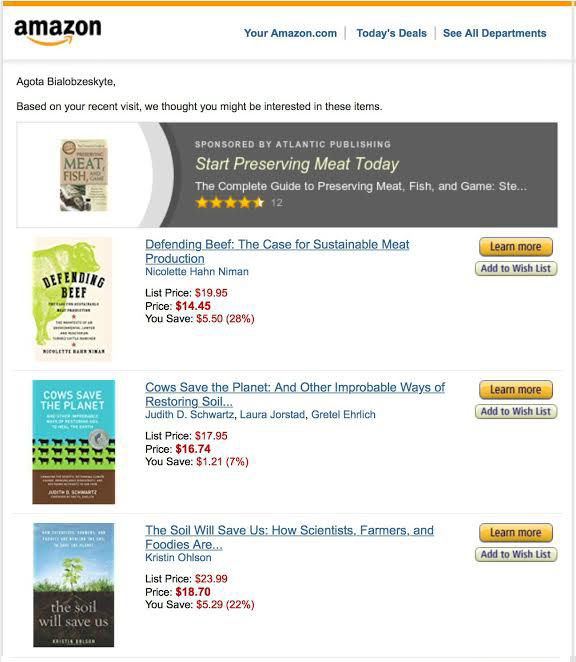 The next email tried to cross-sell similar products while jogging my memory about the abandoned product. One of the integral email marketing tactics for ecommerce is post-purchase follow up. It makes the customer feel that you care about their feedback and customer satisfaction is your top priority. These emails encourage buyers to share their reviews and yield user-generated content for your ecommerce site. The follow up email by Amazon is a great example of how you can build a relationship with your customers even after the purchase is done. As important as it is to bring new customers, it is equally important to retain the existing customers by re-engaging them. Send re-engagement emails to the dormant customers who had purchased from you before but are now inactive. If a subscriber has not opened your emails from the past 60 days, you should send them win-back email campaigns with easily redeemable incentives. Create tailormade emails according to the recipient’s past purchases and search history. You can also send an email asking for feedback or allow the subscriber to change the email preferences. The email by L.L. 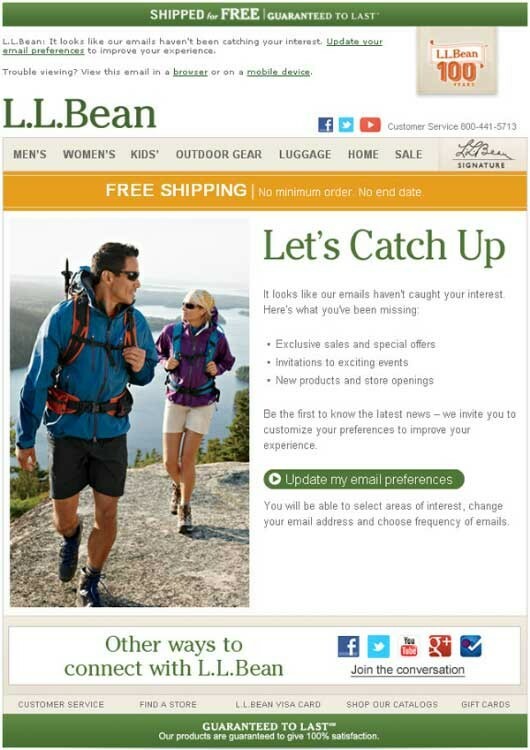 Bean can inspire you to create a winning re-engagement email. Email marketing becomes all the more powerful when it is combined with social media marketing. Let your subscribers know that you have an active social media presence so that they can interact with you on platforms like Facebook, Twitter, and Instagram. You can also promote social media contests or giveaways through emails and drive traffic on your website or social media platforms. In this way, even if your subscribers or customers unsubscribe from your emails, they can still be in touch with your brand through social media updates. Urban Outfitters presents a good example by including the links to all their social media platforms in the email. Ecommerce businesses work better when backed with a good referral strategy. Incentivize your existing customers for referring you and bringing you more sales. Send out special newsletters to your referring customers and thank them with personalized messages. Give the referrers new rewards and introduce a loyalty program for them. However, make sure you avoid fraudulent activities and gamification of the referral process. Email marketing has progressed by leaps and bounds in the past few years. As visual marketing has gained impetus, subscribers are looking forward to more imagery in emails. 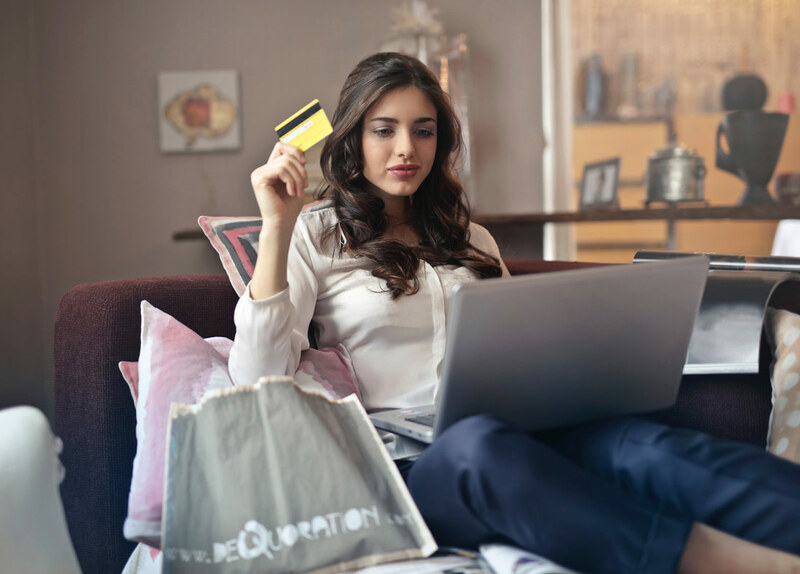 Therefore, your ecommerce emails should include rich media like images, GIFs, and cinemagraphs to display the diverse variety of products in the store. Think out of the box and come up with something new to impart a WOW factor to your emails. Here’s a visually impressive email by UncommonGoods that will ignite the creative side in you. There is maximum scope of generating sales during festive occasions. Ecommerce marketers should make the most of these days and send out promotional emails to the subscribers. Create urgency by promoting limited time offers and entice the recipients to make a purchase. You can use countdowns in emails to drive instant purchases during the peak season. For instance: Thorntons uses countdown in their Christmas email to encourage spontaneous purchases. Testing is mandatory for every email that you send. Run a spellcheck and check for grammatical errors. Also, test the email across the major email clients and devices so that there are no rendering issues. As ecommerce is growing at an unprecedented rate throughout the world, email marketers should pull their socks up and work on building meticulous email campaigns. The tips shared here would surely help you in driving higher conversions and growth for your ecommerce business. If you have any other tips to share, we are all ears. Happy emailing! Chris Donald is the Director of InboxGroup, A professional email marketing agency that specializes in providing advanced email marketing solutions from production to deployment. He has worked directly with Fortune 500 companies, retail giants, nonprofits, SMBs and government bodies in all facets of their email marketing services and marketing automation programs since almost 2 decades. He enjoys sharing his distinctive thoughts and insights into email marketing best practices at his blog.